Ideal therapy for fragile, post-procedure skin. Our concentrated, restorative treatment with Vitamin K, Sunflower and Sweet Almond Oil, helps fade under eye dark circles and puffiness while clearing discolorations associated with rosacea and broken capillaries. Contains Vitamin K 4.5%, Sunflower Oil and Sweet Almond Oil to help fade and clear bruising and improves the appearance of discolored skin caused by spider veins and broken capillaries. Helps reduce under eye dark circles and puffiness. Soothes, hydrates and retains skin’s natural moisture. 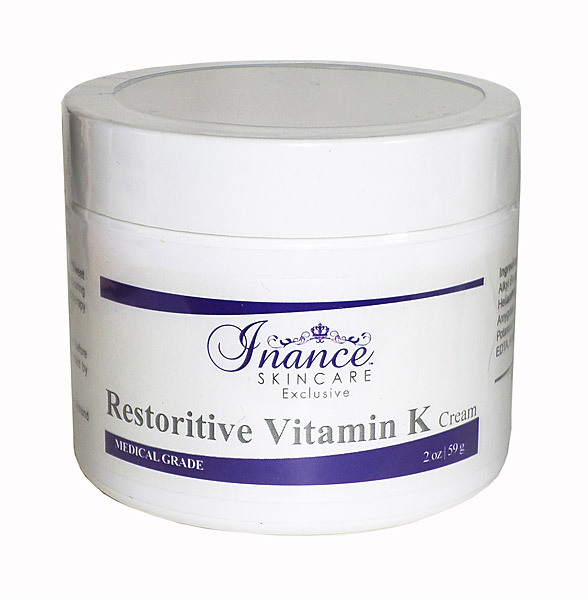 Vitamin K 4.5%, Sunflower Seed Oil, Sweet Almond Oil, Allantoin. Deionized Water, Phytonadione, Glycerin, C12-15 Alkyl Benzoate, Cetyl Alcohol, Triethanolamine, Glycol Distearate, Helianthus Annuus(Sunflower) Seed Oil, Stearyl Alcohol, Prunus Amygdalus Dulcis (Sweet Almond) Oil, Allantoin, Emulsifying Wax, Potassium Cetyl Phosphate, Xanthan Gum, Carbomer, Tetrasodium EDTA, Methylparaben, Propylparaben, Imidazolidinyl Urea. Apply evenly over face and neck. Allow to absorb before applying additional products. Can be used twice daily or as directed by physician.